The Class-Defining FZ-09™: Version 2.0: Packing aggressive style and impressive performance, the original FZ-09 blew open the naked sportbike segment. Now it’s back and more refined than ever, featuring adjustable traction control, a fully-adjustable fork, ABS, and an aggressive look unlike anything else on the road. Powerful Inline-Triple: The FZ-09’s 847cc CP3® engine combines advanced electronic systems-including YCC-T®, Yamaha D-Mode and multi-mode traction control-with a crossplane concept crankshaft to deliver an exciting, torquey and quick-revving engine character built around rider-centric control. Crossplane Concept CP3 Design: The FZ-09’s "Crossplane Crankshaft Concept" engine provides linear torque development in response to the rider’s throttle input, for responsive engine thrust with a strong feeling of power in the low- to mid-rpm range. To boost refinement and provide a smoother ride, the CP3 engine uses a compact counterbalancer to cancel out vibration. Fracture-Split Connecting Rods: The forged connecting rods are made using the fracture-split method-where the big-end ring of the connecting rod is purposefully fractured and then reassembled-to ensure an unparalleled degree of manufacturing accuracy. This creates a pair of perfectly matching halves that produces a much more precise mating surface when they are bolted together again around the crankshaft. Adjustable Horizontal Monocross® Shock: The rear suspension features a linkage-type Monocross shock, adjustable for rebound damping and spring preload. The shock features an almost horizontal alignment-this unusual position improves mass centralization for a slimmer body design. 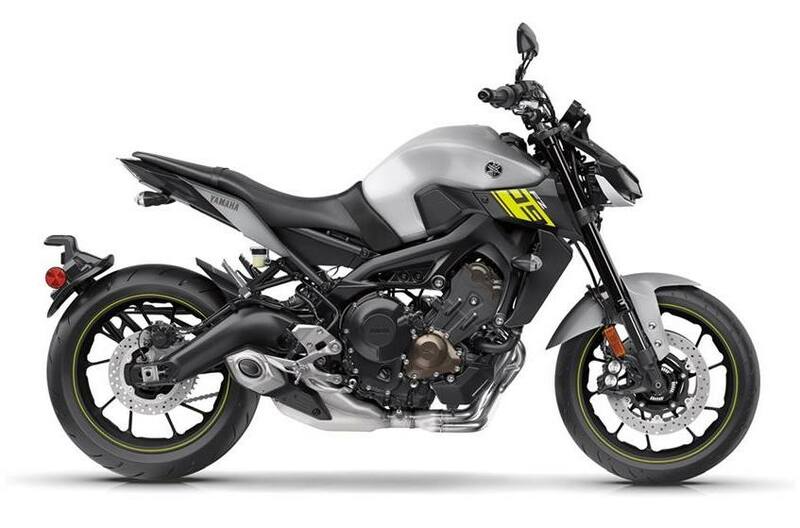 Radical New Styling: From the new LED headlights to sculpted 3D taillight, sleek radiator shrouds to swingarm-mounted license plate mount, the new FZ-09 boasts a more extreme style to push it even further ahead of the naked sportbike class. Adjustable Traction Control: New for 2017, the FZ-09 now comes standard with a two-position (plus off) traction control system, to reduce wheel spin over changing road conditions. Fully Adjustable Front Fork: Using new separate-leg fork damping for independent compression, rebound and preload adjustments, the FZ-09’s inverted fork offers enhanced tuneability, from aggressive sport riding to comfortable commuting. Assist and Slipper Clutch: Yamaha’s assist and slipper clutch reduces lever effort for reduced fatigue in day-to-day riding. At the same time, the slipper system reduces engine back-torque for improved corner entry, even with aggressive downshifting. Anti-Lock Brakes: The FZ-09 comes standard with ABS for secure braking performance across a wide range of surface conditions.